We got a late start on Mother’s Day this year. Not for brunch or lunch or a walk through the gardens, but for the mountain. 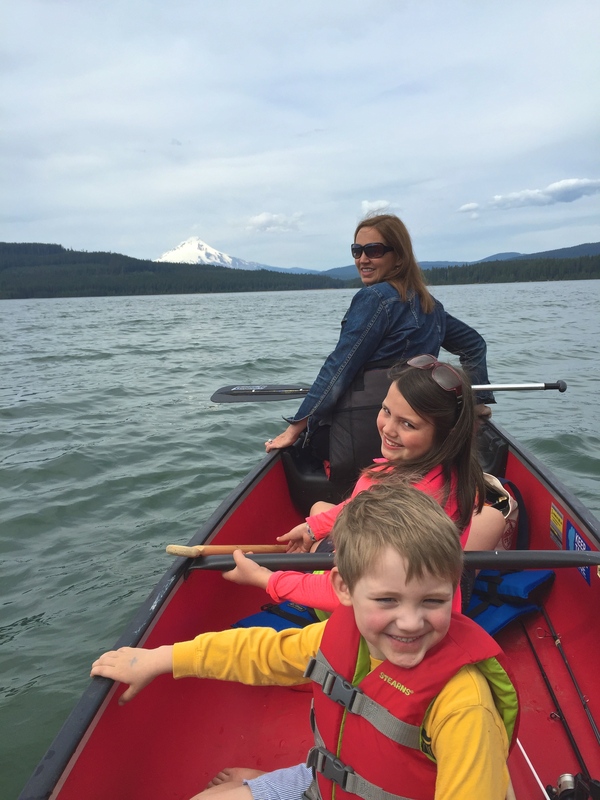 I’m lucky, and so are the kids, that Amy is an adventurous mother, one who I think would rather be out skiing, climbing a mountain or creating some other kind of memorable experience on Mother’s Day — or any day. 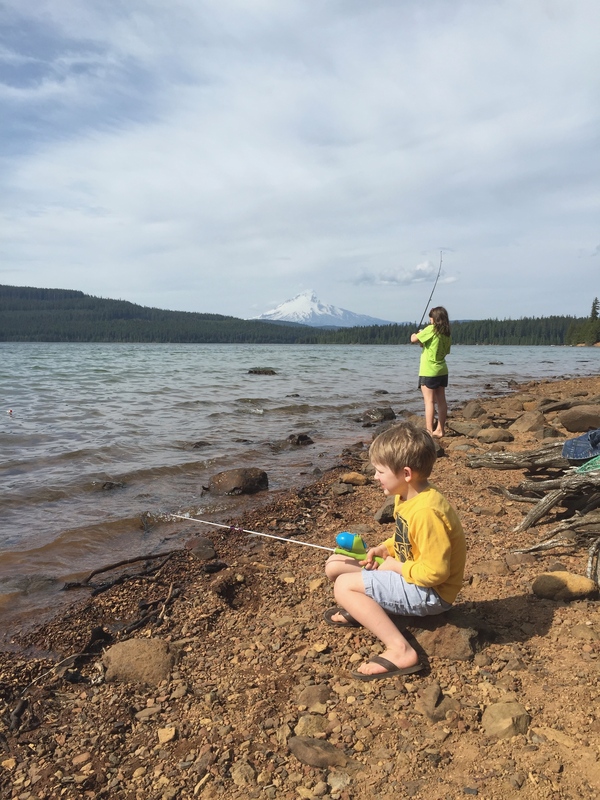 This year’s plan was to chuck the canoe on the car, load up the fishing gear and head for Timothy Lake, a sprawling expanse of mountain lake that sits in the far off southeastern shadow of Hood. We didn’t hit the road until after 11 on Sunday morning, and with a stop at Joe’s Donuts, we weren’t looking to hit the water until well into the afternoon. But our agenda was open, the day was clear enough and the hours of sunlight this time of year mean you can linger plenty long. With that in mind, we decided not to head straight for Timothy Lake, but to instead scout out a lake we’ve cruised passed countless times over the years but never stopped to see. Called Frog Lake, it’s just off Highway 26 past the Highway 35 junction. Though it’s a little more subtle than some of the other lakes around, Frog Lake has its own unique beauty, and a view of Mount Hood that’s all its own. We didn’t stay long, but now we know Frog Lake. Off we headed toward Timothy Lake, first veering a few miles off the route to grab a look at a fascinating little Oregon wonder: Little Crater Lake. 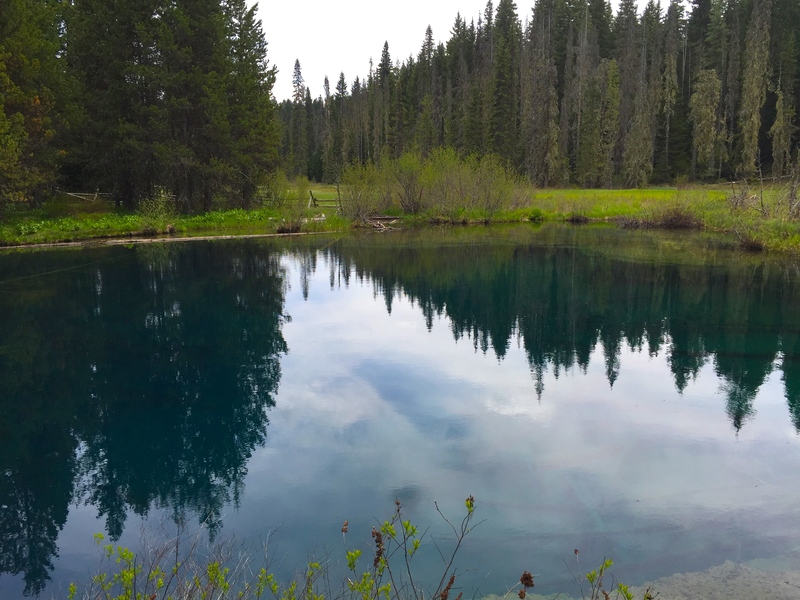 This picture does it no justice — I’m not sure a smartphone will ever really be able to capture the true, natural turquoise and blue hues of this incredible spring-fed lake — but I grabbed a shot just for the record. It’s been years since we’ve been back to Timothy Lake. In fact, we’ve yet to take the kids there, so it seemed like a good time to refresh ourselves and introduce them to it. I wasn’t expecting any surprises, but as we were driving around the lake’s southern shores looking for an easy access for the boat, what should tumble out of the forest but an honest to goodness black bear. Now, I’ve been all over the Mount Hood National Forest in my 18 years in Oregon, but I’ve only seen one bear in that time. That one was running up the Forest Service road ahead of a tour bus I was on during an exploration of the Bull Run Watershed back when I was researching for On Mount Hood. This one bounded right out of the trees about 50 feet in front of us, galloped across the road and plunged back into the woods. He was in view just long enough for all of us to see him and for me to drop a reactionary profanity underscoring my amazement. Crazy how exhilarating that 10-second snapshot was. Out on the lake, we were among just a handful of like-minded folks who decided that Mother’s Day was a great day for Timothy Lake. And it was. The kids didn’t catch anything — no one did — but we didn’t need to. Being out on the lake, with the mountain in the background and the sun breaking through just enough to warm was plenty. We paddled back on the edge of a thunderstorm, loaded up and pointed homeward. But we had one more new experience to add to the day still: dinner at the Skyway Bar and Grill, a funky roadside attraction that, like Frog Lake, we’ve been passing for years but have never explored. We were told that It’s named after the famed Mount Hood Skiway, an old city bus converted into a cable tram that ran from Government Camp to Timberline for a few years in the 1950s. After some incredible barbecue, fries and macaroni and cheese in front of a crackling fire, we’ve found a new mountain favorite. And that was Mother’s Day 2015 — an adventure all around. This entry was posted on May 11, 2015 by onmounthood. 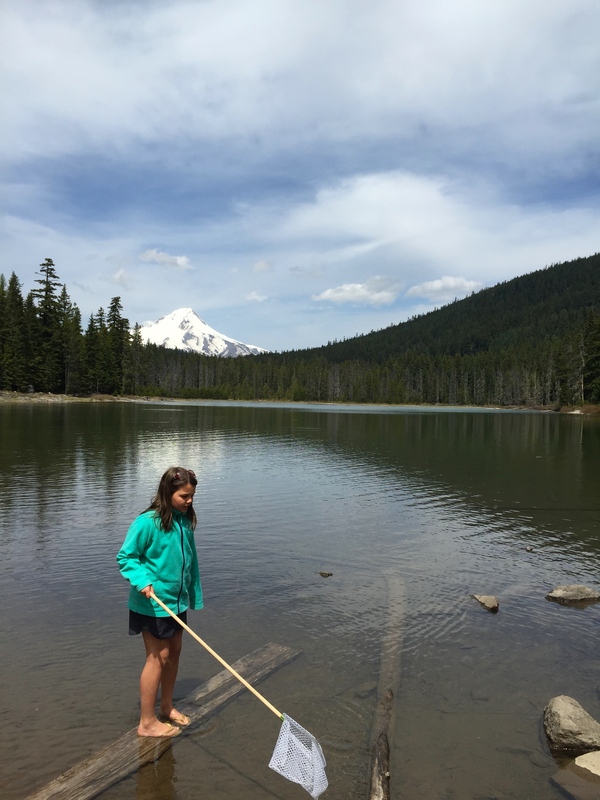 It was filed under Lakes of Mount Hood, Mount Hood and was tagged with book, canoeing, fishing, food, frog lake, little crater lake, mother's day, Mount Hood, skyway, timothy lake.